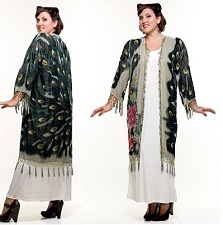 This is a STUNNING, soft and supple, silk and burnout velvet beaded reproduction 1920’s-30’s fringe coat in Peacock print. The color is a gorgeous shimmery dark green on a neutral background. Sequins scattered throughout. It has a custom ART DECO/ART Nouveau Peacock motif. Generous and gorgeous beading and fringe throughout. Open front for a flexible fit. Length (with fringe) 44″. Shoulder to shoulder 17″. Across back 19″ from underarm to underarm. Fits sizes Medium to Large. Plus size: Length (with fringe) 44″. Shoulder to shoulder 27″. Across back 30″ from underarm to underarm.